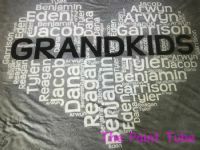 This 50 x 60 soft feel blanket will make any grandparents or family happy! No limit in amount of names! and List word want to,use for the theme of the blanket!